Just a nice little video of a guy and his old, Russian ZIL 157. If you’re in the market for an amphibious, 6×6 off-roader, have a look at this mid-60s Alvis Stalwart. It features a 220-hp straight-eight Rolls-Royce engine, a 25,000-lb. winch, and a 12,000-lb. boom in the bed. A few caveats before you grab your checkbook: The only way to get into this thing is through the hatches on the roof. It’s lack of a center differential means you can’t drive it on the road without destroying the transmission. And, of course, it’s British, so watch the electrics. Another note of caution: some of these trucks had all of their swim gear removed in the 80s, while still in military service. Finding parts to rebuild those systems… let’s just say that Alvis never had much of a US dealer network. That said, if you want a truly go-anywhere vehicle, and have the technical and financial resources to keep this 50-year-old beast running, it could be the vehicle for you. 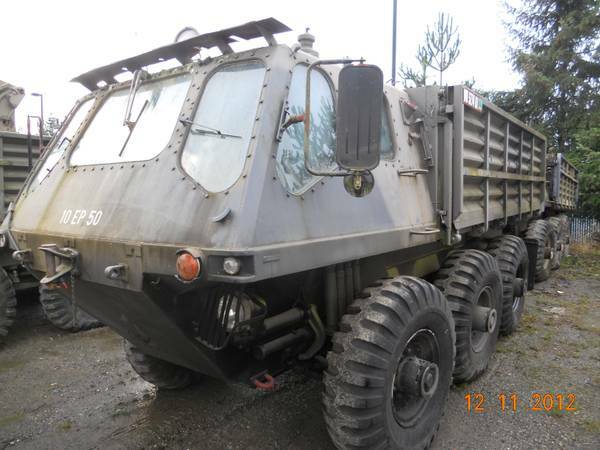 This Alvis Stalwart is located in Puyallup, Washington, near Seattle, with an $8500 asking price. A video about the Alvis and more pictures after the jump. Watch Top Gear’s James May take on an autonomous, 6×6 military truck at a Nevada proving ground. James’ wields the new Range Rover in this automotive desert duel. Those Top Gear guys do know how to make entertaining TV. Here’s a Pinzgauer 712K with a cool, camo paint job going for a drive in what appears to be the Russian Countryside. Quite a nice little video. For times when an already capable 4-wheel-drive G Class just won’t do, Mercedes-Benz has announced that, come October, it will offer this outrageous-looking 6×6 version. It’s specified in G63 trim, meaning this über-off-roader will get its grunt from a twin-turbo, AMG 5.5-liter V8, which will slam 544 horsepower and 560 foot-pounds of torque through a seven-speed, automatic transmission. That’s enough to propel this 8,300-lb. goliath from 0 to 60 in about 6 seconds. Damn. Other features include portal axles, five locking differentials, cabin-controlled tire pressure adjustment, and 37-inch wheels. Interested? The price hasn’t been set but expect to pay in the neighborhood of $450,000. Want to read more? Check the links below. More photos after the jump. 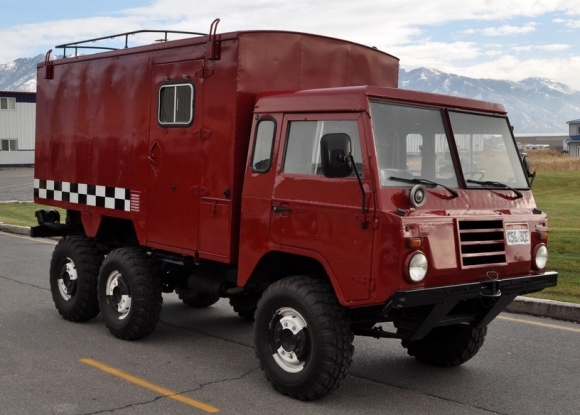 Here’s another off-road legend from Bring a Trailer. In civilian guise the 6×6 Volvo C304 and its cousin, the 4×4 Volvo C303, are formidable off-roaders, with high-ground-clearance portal axles, vacuum-locking differentials, and a 28″ fording depth. When they were commissioned by the Swedish military, they were known as the Volvo Tgb. In this case, the Tgb 1314 was the ambulance model. If you’re looking for a go-anywhere truck to turn into an expedition vehicle or camper, this would make a great choice. While this truck hasn’t been restored, its only covered just over 12,500 miles in its life and has been treated to a bare-metal respray. The vinyl checkerboard decals on the sides are said to be easily removable. This Tgb 1314 is available in Logan, Utah, for only $22,000, which sounds like a great deal for a capable truck with interior room to spare. In case you’d like to do more research here’s are links to the C303/C304 Wikipedia page and the C303/C304 owners manual. Here’s a Swiss military vehicle we don’t hear too much about: Bucher Duro. They’re available in 4×4 and 6×6 configurations (and work best when accompanied by a euro-business-pop soundtrack, apparently).